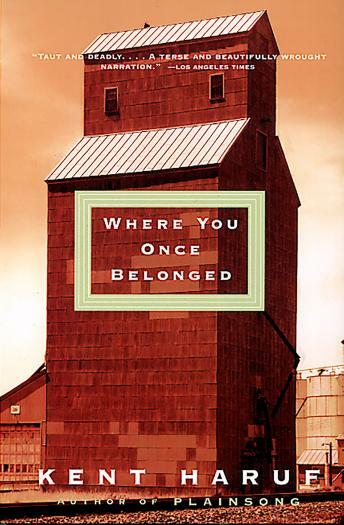 In Where You Once Belonged, the bestselling and award-winning novelist of Eventide, Kent Haruf tells of a small-town hero who is dealt an enviable hand--and cheats with all of the cards. Deftly plotted, defiantly honest, Where You Once Belonged sings the song of a wounded prairie community in a narrative with the earmarks of a modern American classic. In prose as lean and supple as a spring switch, Haruf describes a high school football star who wins the heart of the loveliest girl in the county and the admiration of men twice his age. Fun-loving, independent, Burdette engages in the occasional prank. But when he turns into a man, his high jinks turn into crimes--with unspeakable consequences. Now, eight years later, Burdette has returned to commit his greatest trespass of all. And the people of Holt may not be able to stop him.